Coming down from the Middle-eastern cultures, Seekh Kebabs were usually enjoyed by non-vegetarians. Coming down from the Middle-eastern cultures, Seekh Kebabs were usually enjoyed by non-vegetarians. 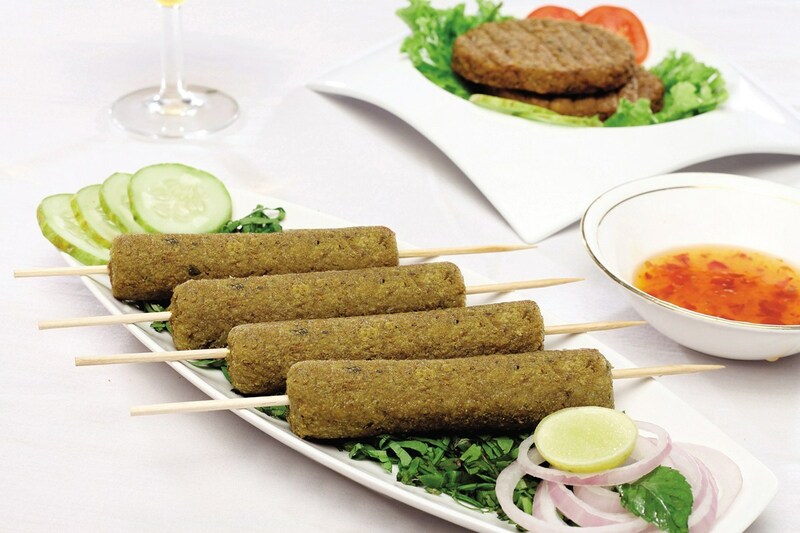 But don’t worry; here is a vegetarian Seekh kebab recipe that can be enjoyed by everyone. This dish can be served as a starter dish or a snack with a cup of tea. Get ready to indulge yourself in this invigorating Seekh Kebab recipe card. Start by soaking the Bengal gram in water for about 15 minutes and simultaneously soak the soya nuggets in warm water for about 15-20 minutes as well. Take all the ingredients mentioned in the spices mix and grind them together to make a fine powder. Squeeze the water from the soya nuggets and bring them to a boil in ample amount of water for 5 minutes and drain. After this squeeze the excess water from the soya nuggets. Use two separate pressure cookers to cook the Bengal gram and the soya nuggets, with ½ a cup of water. After one whistle from the pressure cooker (kept on medium flame), drain the water and squeeze the soya nuggets. Heat 1 tbsp. butter and 1 tsp. sunflower oil in a heavy bottom pan and to this add the boiled grams and soya nuggets. Stir-fry for 2 to 3 minutes on high flame, this will evaporate the remaining moisture. Leave this mixture to cool for a while. Now, grind the Bengal gram, soya nuggets and the green chilies till it makes a coarse paste. Transfer this mixture to a bowl and add the breadcrumbs, corn flour, spices mix, chili powder, mango powder and the fresh cilantro. Mix this well till the elements are well blended. Take satay sticks and apply this Seekh kebab mixture evenly along the stick. Gently flip the Seekh kebab on the satay stick every 2 to 3 minutes to make sure you get a nice golden color on all the sides. Serve the Seekh kebab hot with your choice of condiment. You can step away from the traditional Seekh kebab style mentioned in this recipe and make round patties with the mixture to make Shami kebabs or cutlets. They are perfect for a vegetarian barbeque party as well. Serve with cool mint chutney and sliced onions and green chilies for an enhanced tasteful experience.